Three principal methods have been employed at different times and in different countries for the disposition of the dead: mummification, incineration, and interment. Mummification was practised by the Egyptians from the most remote period to the 6th century of in urns made of various materials. These were preserved in tombs usually built on the roadsides without the city gates. The burial of the dead by the nearest relatives was a sacred duty, and its neglect exposed them to grave accusations. After the funeral the family of the deceased partook of a feast at the house of the nearest kinsman; and at Athens the period of mourning continued 30 days, during which other sacrifices and feasts were celebrated. In the representation of these ceremonies on monuments, a horse's head is usually found in one corner, intended to represent death as a journey. 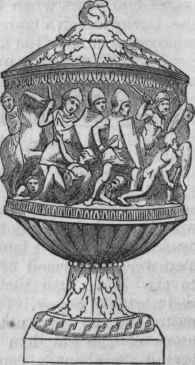 The punishment of certain criminals was aggravated by the denial of funeral rites, and there were places both at Athens and Sparta into which the bodies of such criminals were cast. - In the olden times of the republic the Romans generally buried their dead, though burning was likewise practised. Sulla appears to have been the first of the Cornelian gens who was burned. Under the empire burning became customary, until it was subverted by the gradual spread of Christianity, and at the end of the 4th century it had again fallen into general disuse. The funeral rites varied according to the wealth of the deceased. In the latter days of the republic and under the earlier emperors, the remains of the rich were washed, anointed with oil, and perfumed by the slaves of the undertakers, who, from residing near the temple of Venus Libitina, where funereal articles were sold, were called Libi-tinarii. A coin was placed in the mouth of the corpse to pay its ferriage into Hades, and the body, dressed as well as possible, was placed with its feet toward the door in the vestibule of the house. If the deceased had received an honorary crown, it was placed upon the head, the couch was often adorned with flowers, and a branch of cypress placed before the door. The funeral took place at night. The procession, headed by musicians, was attended by hired mourners, who sang the funeral song; next came the freedmen of the deceased, wearing the cap of liberty. Immediately preceding the corpse persons with waxen masks represented the ancestry of the deceased; the corpse itself, placed upon the couch, was generally borne by the freedmen or by the nearest of kin; the family followed after, the men with their heads covered, the women uncovered and with dishevelled hair, beating their breasts and uttering piercing cries. If warranted by the rank of the deceased, the procession passed through the forum, and an oration was there pronounced. Finally, the corpse, with the couch upon which it was borne, was placed upon the funeral pyre, built commonly in the form of an altar, with four equal sides. The nearest relative, with averted face, kindled the pyre, and perfumes, oils, articles of food, ornaments, and clothing were frequently thrown on while it was being consumed. The embers were extinguished with wine, and the bones and ashes carefully collected by the nearest of kin, sprinkled with perfumes, and placed in an urn. These urns (ollae) were of various forms and materials, and when sealed they were deposited in pairs in niches made in the perpendicular walls of chambers or enclosed places constructed for the purpose, or sometimes by the roadside, and called columbaria, from the resemblance of their arrangement to a dovecote. 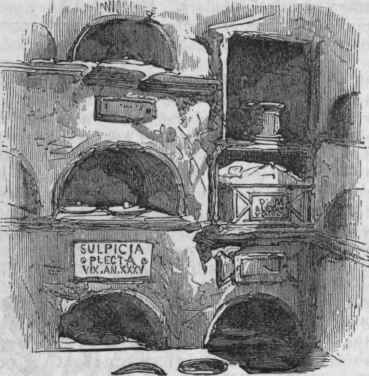 The ashes of the lower classes and of dependants were deposited with less care in sepulchral chambers, each of which was also called a columbarium, the plural being invariably used in speaking of the niches. The mourning and sacrifices were continued for nine days, and by the women mourning was sometimes worn for a year on the death of a husband or father. - The early Christian martyrs were buried in churches, and afterward distinguished persons shared this privilege, which eventually was extended indiscriminately, either within or near churches, and to such an extent as to produce deleterious effects. This practice was abolished in France early in 1777, and has been generally discontinued elsewhere. In London, in some of the poorer districts, the soil of the churchyards was raised two, three, or even four feet in a few years, and not only was the atmosphere of the neighborhood rendered most unhealthy, but accidents occurred from the carbonic acid gas given off during decomposition breaking into cellars near the cemeteries. - The suttee or voluntary immolation of a widow, by burning or burying alive in connection with the body of her husband, formerly prevalent in India, is now of rare occurrence. 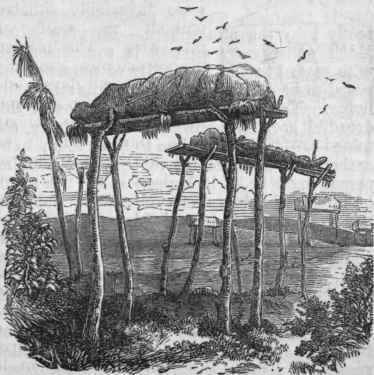 Many savage tribes in various parts of the world suspend their dead from trees, or place them upon elevated platforms. The latter custom was practised by many of the North American Indians. Among the Turks and other eastern nations, the dead are treated with reverence, and buried in cemeteries which are carefully kept. Among the modern Greeks the faces of the dead are usually uncovered while they are borne to the burial ground. The orthodox Jews retain several of the mourning ceremonies of their ancestors. Among the lower classes of the Irish the funeral ceremonies frequently begin with a "wake," of which copious stimulants form an important part, and the mourning often degenerates into orgies. In the burial grounds of England, France, and other European countries, it is customary for friends to strew flowers upon the graves at frequent intervals. In the United States burial grounds are usually outside of the limits of towns and villages, though churchyards are still frequently used in small places; and the funeral ceremonies, varying somewhat among different denominations, are similar to those of Europe. Beautiful cemeteries have been established in the neighborhood of the principal cities, and upon the sites of many of the battle fields of the civil war. (See Cemetery.) - The period required for the body to decay after inhumation varies greatly according to the climate, the nature of the soil, and the covering in which it is enveloped. Orfila and Lesueur in their experiments found nothing but the skeletons left of bodies that had been buried 14, 15, and 18 months; this period was, however, unusually short. Low, damp grounds, particularly when they are percolated by water, hasten decomposition; dry, high, and well ventilated ones, on the contrary, retard it. When numerous burials within a comparatively short period have occurred in a limited space, the earth becomes saturated with the products of decomposition to such a degree as to be incapable of further absorbing them; decomposition under such circumstances is retarded, and its products escape directly into the atmosphere. - Burying Alive. Much unnecessary anxiety is sometimes felt with regard to the possibility of persons, supposed to be dead, being buried while still really living. None of the numerous stories of this dreadful accident, however, which have obtained credence from time to time, seem to be authentic. The premature burial of a living person must be, if it happen at all, the result of inexcusable haste or carelessness, and is in the highest degree improbable where even the ordinary precautions are taken. A proper examination of the body by a competent medical man, in doubtful cases, would render such a mistake almost impossible. The signs of death are either immediate or secondary. The immediate signs are stoppage of the movements of the heart and the various consequences which result from their cessation. The secondary signs, which are developed only after a certain time has elapsed, are cadaveric rigidity of the muscles and the commencement of putrefaction. Of all the immediate signs, the only one which by itself is absolutely certain is the complete cessation of the heart's action. This may be ascertained by careful examination of the chest by auscultation. During a fainting fit the heart is still heard to beat, and in the dying, after the last expiration has proclaimed that all is over, after the pulse has ceased to beat, and after the hand applied over the heart finds everything still, the ear placed upon the same region still hears for a time the beating of that organ; but when, after having listened for a sufficient time, the practised auscultator cannot distinguish the beat of the heart, life is over. In examining the heart in a number of the dying, Bouchat found that the longest interval between the pulsations was six seconds; from a similar investigation M. Rayer found it to be seven seconds. "If," concludes the latter, "the absence of the pulsation of the heart is verified by the auscultator for a period 50 times as great as the longest observed period, or for an interval of five minutes, the patient is undoubtedly dead." Even this, however, admits of some exceptions. In new-born infants the action of the heart may have ceased for a longer period, and yet the child revive, and the same thing is said to have occurred in the cold stage of Asiatic cholera. M. Michel Levy proposes on these accounts that the verification of decease should take place at two periods, separated by an interval of 24 hours, and considers that if on both these occasions the absence of all movement of the heart for a sufficient length of time is noticed by a competent observer, the interment may take place in perfect safety. 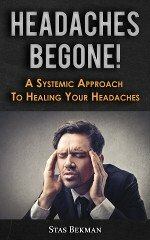 "When by an excess of precaution further evidence of death may be desired, he • recommends the application of an iron heated to redness to the skin; this has the double advantage of distinguishing between real and apparent death, and of rousing the patient energetically where death has not occurred. The application of a red-hot iron to the living body for a length of time sufficient to cause the total destruction of the whole thickness of the skin, the injury being surrounded by a vivid redness, causes in the dead body merely a slight shrivelling of the epidermis, and a searing of the superficial layer of the true skin. - To prevent the occurrence of premature interment, mortuary houses have been built in Germany and other countries, in which the dead are retained for a time before the final interment. A bell-pull is so arranged in connection with the extremities of the corpse, that the slightest motion will sound an alarm, and summon an attendant constantly on the watch. So far, these precautions have been useless; a surgeon who for 45 years had been attached to the mortuary house at Mentz, had during that period but one single alarm; it occurred from the corpse of an old man; the abdomen having subsided from the discharge of a large quantity of fluid, the arms had fallen lengthwise beside the body. - See Funerailles des Romains, Grecs et autres nations, by Claude Guichard (Lyons, 1581); Ceremonies funebres de toutes les nations, by Muret (1679); Die Gruber der Hellenen, by Stackelberg (Berlin, 1837); Die Leichenbestat-tung, by Trusen (Breslau, 1855); Histoire des usages funebres et des sepultures des peuples anciens, by C. Feydeau (3 vols., Paris, 1858); Die heidnische Todtenbestattung in Deutsch-land, by Weinhold (Vienna, 1859); Denkschrift zur Leichenverbrennung (Namslau, 1860); and especially Traite des signes de la mort, et des moyens deprevenir les enterrements prematures, by Eugene Bouchat (Paris, 1849), a work which gained an academical prize. Madame Necker (1790), Dr. Vigne (1841), and others have also written on premature interments. Columbaria in the Appian Way.